The replacement cartridge for our smaller Legacy 105 provides safe, great tasting water for less than a penny per gallon! Perfect choice for plumbed-in (bottle-less) water coolers. Perfect for Beer and Wine Making Hobbies where water quality is so important. Because of many unknown variables, filter Capacity is not Guaranteed when used with well water. Wells may benefit from the addition of an inexpensive sediment pre-filter. 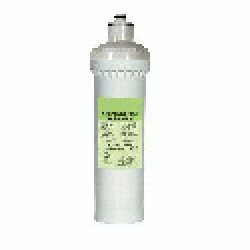 Please have well water tested before purchasing any filtration product. After having kidney stones I decided drinking more water would be a smart idea, but our city water tastes like a chemical factory, and I wasn't into hauling bottled water up my appartment stairs every day. So I installed the Legacy 105 under my sink. Installation was a no-brainer. Had it done is a half hour at most. I couldn't believe what a difference it made! Now the water out of our sink rocks! And all of us are drinking so much more water than we used to. It's already paid for itself in what we saved from buying bottled water and all the other stuff we were drinking. Purchasing the Legacy 105 was one of the best things that I have ever done. After moving into our new house and tasting the difference in the water before and after installing the water filter is amazing. Now I drink SO much more water. Also, I have been trying to lose weight for years and now since I have installed the Legacy 105, and drinking my 8+ glasses a day I have lost 15 pounds. Also, the customer service is incredible. I would (and do) recommend this water filter to everyone I know. I had been using one of those little water filters for years when all of a sudden they just didn't work for us anymore. Our water began to taste really bad, even with the filter. Finally I contacted my municipal water department to see if they knew what was going on. That's when I learned they had started using chloramine instead of chlorine in our water. I hadn't heard of the Legacy before, but I took a chance because they seemed to be the best for taking out chloramine. We sure are happy we did! This filter really does the job on Chloramine. Our water tastes great now and I'm glad to just install it and forget it instead of having to replace those small "toy" cartridges all the time. Great customer service too! When my water company changed from using Chlorine to Chloramine my water began tasting really bad. My old water filter just didn't seem to work anymore. I hadn't heard of the Legacy, but decided to give it a chance since they claimed to have a technology that works well on removing Chloramine. We couldn't be happier! The Legacy 105 was easy to install, and our water tastes GREAT! What a relief to find a product that does what it claims to do.